As new housing transforms the face of downtown Oakland, an ambitious plan to relocate the city’s night herons proceeds, along with a student-led effort to make them the city’s official bird. If kids ruled Oakland, black-crowned night herons would already be the city’s official bird. 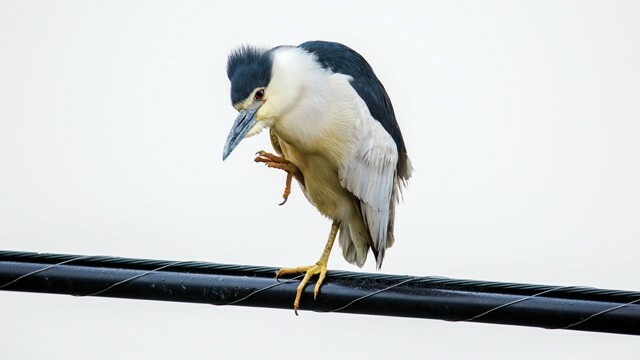 As it is, a group of Park Day School students is planning to relaunch a petition to help protect these night birds that go kwok in the dark—as an ambitious project to relocate the herons’ downtown rookery moves forward. As third-grade Park Day teacher Devin Homme explained, last year, a group of his students launched a petition to make the night heron Oakland’s official bird, after learning that the largest night-heron rookery in the Bay Area is in downtown Oakland—a less than ideal location, thanks to the fact that heron chicks tend to shove their weaker siblings out of the nest. In nature, dislodged chicks should be able to climb back up the tree—or start flying, if they are more mature, explained Cindy Margulis, executive director of the Golden Gate Audubon Society. “But in this case, they are stranded or doomed, unless we take then to rehab,” Margulis said, referring to chicks that get hurt or squished when they fall onto sidewalks or into traffic. “The only way for a heron rookery to become self-sustaining is through relocation to a natural setting,” she said. And Everett recalled hearing about plans to relocate the rookery, because new housing development in downtown would require removing the trees where the birds have nested for the past decade. “One idea was to move the birds to somewhere safe, like, maybe a little island on Lake Merritt,” Everett said. And now those relocation plans are moving forward: In November, biologists retrieved 130 night-heron and 20 snowy-egret nests from ficus trees on Harrison and 12th streets, and then contractors drastically pruned the trees to prevent more nesting. The next day, crews removed 13 ficus trees around a parking lot that covered the city block between 13th, 14th, Alice, and Jackson streets. No one knows what the herons thought, since they don’t start nesting until February. But passersby expressed concern about the future of the birds as workers cut down the trees. Margulis said she was glad everyone cares about the herons, but it’s not against the law to remove trees or a night-heron rookery—once nesting season is over. “So, I commend the city and the project developer for taking the relocation project seriously,” she said. Ironically, it was bird poop on Alice Street that thrust Oakland’s herons into the headlines in May 2014, after the U.S. Postal Service hired a contractor to trim trees outside its 13th Street facility—an ill-advised attempt to prevent herons from pooping onto postal trucks. The incident went viral after it was falsely reported that the contractor chipped the chicks. In fact, the chicks were rescued and released into the wild, the contractor paid the costs of their rehab, and Margulis produced a bilingual brochure that the city posted about the best time to cut trees. But the rookery location remained a problem in downtown. In 2016, Margulis partnered with the zoo to save about 25 chicks that fell from the rookery. Last year, the number of rookery falls more than doubled—a spike Margulis attributed to a ficus that split and fell across 14th Street in nesting season. “In total, we saved more than 65 birds that would otherwise have been run over or died on the streets, victims of starvation, hyperthermia, and thirst,” she said. But the rescues were a big drain on resources, all of which makes Margulis hopeful about the plan to relocate herons to three separate sites at Lake Merritt: two sets of groves of mature trees on the Glen Echo arm, and on one of the lake’s “non-cormorant” islands. The upshot was that Holland Partners Group, which is developing a mixed-use project at 226 13th Street; the Martin Group, which is developing mixed-use projects at 301 12th Street; and affordable housing developer East Bay Asian Local Development Group, which is building at 285 12th Street, agreed to do the rookery relocation project as a condition of getting their permits. Margulis praised the developers for agreeing to prune and remove two separate groves of ficus trees in the same season. “We didn’t want the birds to have to move twice, so we synchronized the operations,” she said. Steve Rottenborn, vice president of H.T. Harvey, the ecological consultants for the rookery project, credited senior ecologist Jeff Smith for putting together Oakland’s relocation plan. “Jeff has the knowledge and expertise and has done the lion’s share of work,” he said. Holland Partners’ Ray Connell said the relocation project cost is $200,000 and involved hiring specialists and creating new rookery sites, as well as storing nests and removing and trimming trees. “They were all city trees, and the city tied the rookery relocation to these two development sites,” he said. Holland Partners also plans to replace the ficuses that were cut down with native plants. Connell anticipates nests being placed at the new sites in early January, given that night herons start nesting in February. “We don’t want to put the nests up too early as that creates an opportunity for other animals to disturb them,” he said. Connell agreed that rookery relocation is risky, and the herons could move to other ficus trees in the downtown area. “If they do, we will learn something from it,” he said. As for the Park Day students, last year they met with Councilmember Dan Kalb, papered Oakland with heron art, and even secured Mayor Libby Schaaf’s verbal support for their petition, which garnered about 1,440 signatures. And you can bet your night-heron breeding feathers that the students are preparing to relaunch their petition, this time with the support of Oakland Zoo, as they track the rookery relocation project. Too Many Rapes Dismissed Setting Her Sights Higher?